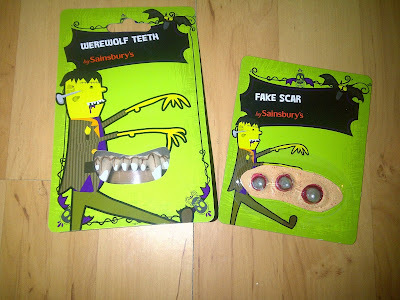 Have A Spooktaciular & Spooky Halloween With Sainsbury's! I am pleased to announce that Sainsbury's have very kindly agreed to take part in Unique Young Mum's second Halloween feature and I am honoured to have them aboard again! 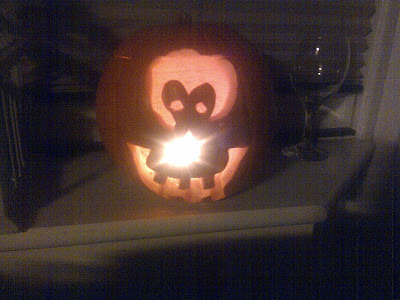 I think its safe to say they are Unique Young Mum's star Halloween feature company again for the second year running! Whatever your getting up to this Halloween, Sainsbury's has it all covered for you, no need to go shopping around at various places because at Sainsbury's, your find it all under one roof! Are you ready? Okay... 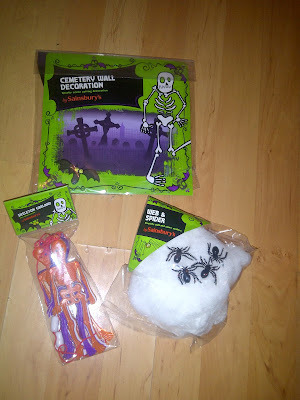 Sit back relax and let me introduce you to just SOME of the Sainsbury's Halloween range! You don't have to throw a party to set a spooky scene this Halloween, if your not a Trick'or'Treat believer or simply don't want to face the cold this year, why not buy some Halloween plates, bowls, napkins and cups and have a little tea party for you and your family at home? Alternatively, dish up dinner on the plates, eat your pudding from the bowls and use the napkins to wipe away the yummy feast residue remaining on your lips! Wash it down with a nice glass of drink from the cups and you've had your very own Halloween themed evening! 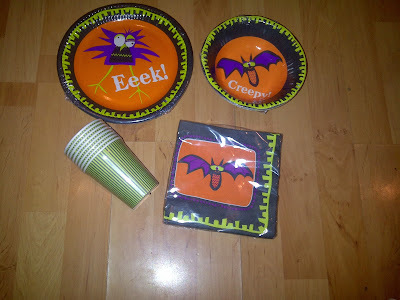 If you are having a party, of course these bat themed party items are the perfect products for that Halloween bash! No home would be complete this Halloween without some spooktacular decorations! There is no need to go overboard if you don't want too, but of course, if your willing too, I'd say go for it! 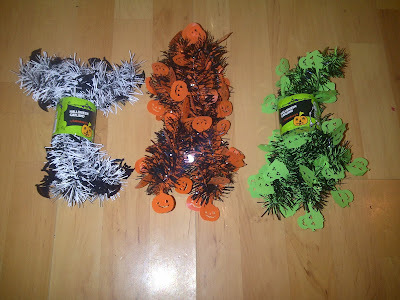 These Halloween themed tinsel is perfect for a small decoration feature or completes the full Halloween makeover! 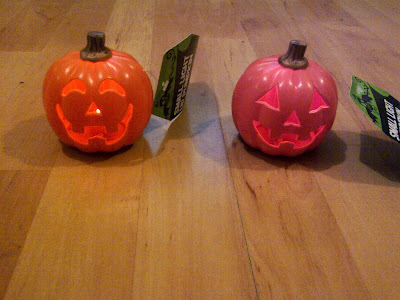 Why not pop some around your pumpkin or around your windows like we did below? 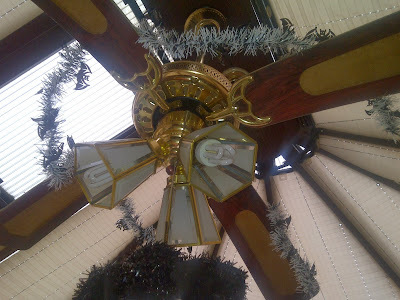 The possibilities of what you can do with the tinsel garland really is endless, below you can see how we wrapped it around the fan, that was not in use! I mean unless your a ghost, why would you want the fan on it winter, burrreeh. 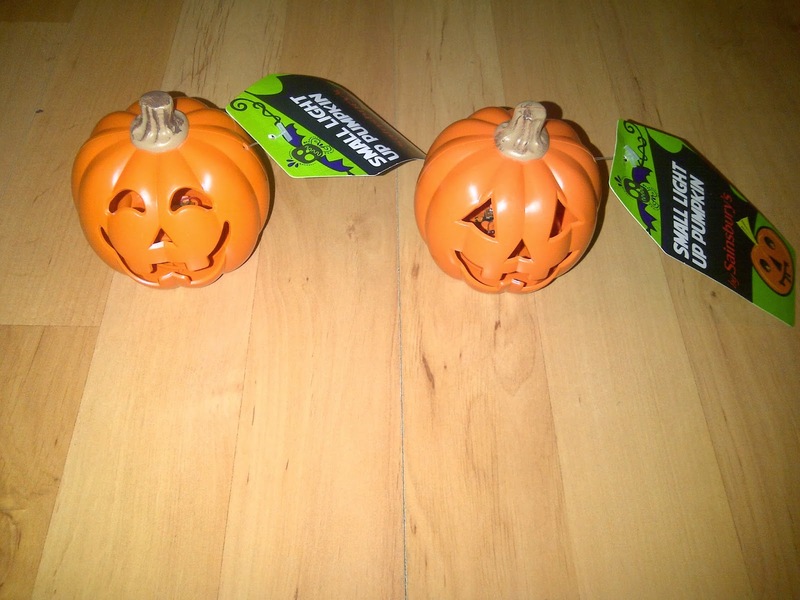 Available in a black and white bat theme, a black and orange pumpkin theme and a black and green Frankenstein theme, all old separately from selected Sainsbury's stores nationwide. 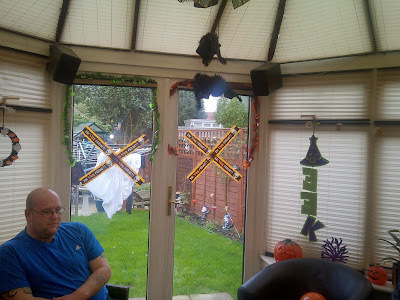 Plastic Skeleton Garland, Fake Web & Spiders and Cemetery Wall Decoration. The fake spider web can be used with or without the fake plastic spiders which is a result for us humans scared of the horrifying creatures! Thankfully the spiders were cute enough to be out, but the children wanted to play with them, well actually throw them at the adults to scare them! 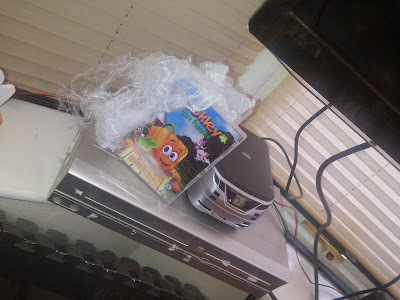 Here is the fake web giving Spookley the DVD a little scene makeover, you can read our review of Spookley here, but if you want to skip the review, its available to buy from Sainsbury's online & in stores nationwide for just £7.99! 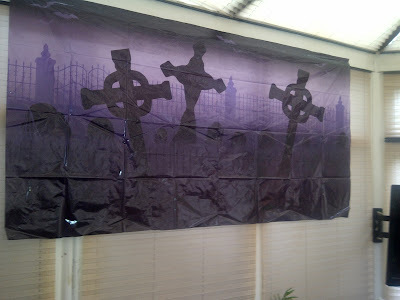 The cemetery wall feature really helped set the scene at our Halloween feature party! 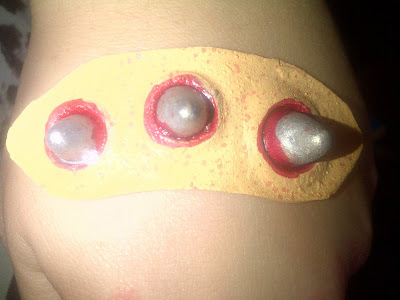 We stuck it up with tac and was surprised it lasted the whole way through the party and did not fall down once! This pack of individual multi coloured skeletons would be a great front door or window feature for any little guest knocking your door this Halloween. We used the set at our Halloween feature to brighten up a dull looking wall! 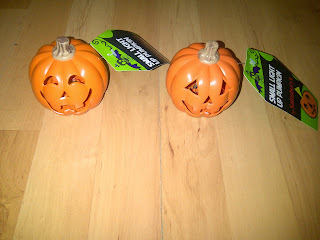 These small but very cute light up pumpkins are perfect as small decorations, we will be using them at our Halloween feature party and used them to decorate the sweet pile ready for any guest brave enough to knock our door, mwuahahaha. The pumpkins are sold individually and have batteries included. Available from selected Sainsbury's stores nationwide. 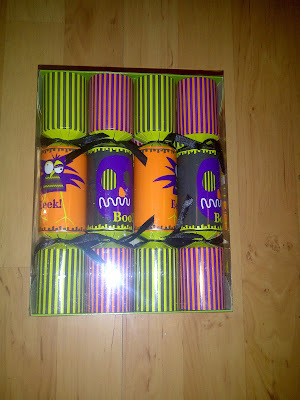 These adorable little Halloween crackers are a firm favourite of mine and Spud's from Sainsbury's Halloween range. We first come across the crackers when Sainsbury's sent us a selection of items including crackers. We was thrilled to see Sainsbury's have decided to do them again for 2013. These are perfect for Halloween parties, Halloween dinners or for tricks when little Trick'or'Treaters brave your door by saying trick! Inside each cracker your find a plain coloured hat, a joke and a little Halloween themed toy. It's great to see Halloween becoming more widely celebrated here in the UK and it's great to see Sainsbury's making such products for the occasion! When Sainsbury's gave us the pick of what costume to choose for Spud, we both fell in love with this costume. 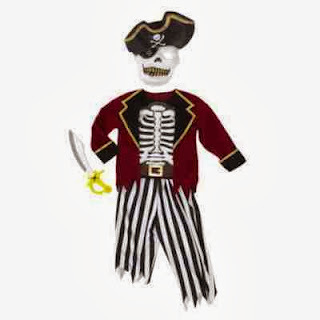 You find skeleton costumes everywhere on Halloween, and you can find pirate ones all year round, but you never see the two combined together. Spud was one very excited boy when the box full of goods arrived from Sainsbury's and instantly put his new costume on! 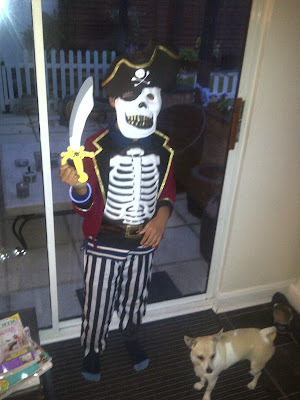 I was extremely pleased with the costume, not only did it come with everything you need (the top/attached fancy blazer, the trousers, the mask and the sword) it was also big enough for Spud to wear a thick polo top underneath his top half and jeans underneath his bottom half. As the mask (which wasn't a cheap tacky made made) covered all of his face, we didn't need no make up and it also come with an accessory - the sword! Sainsbury's have a great range of costumes for all sizes in stores nationwide. Sainsbury's have a great range of costume accessories this year, if you don't want to do the full dress up, why not have a little Halloween makeover with a fake scar like I did? Or if your having the full dress up, make sure you check out their fab range of products such as the werewolf teeth or witches hats! With prices as low as pennies, check out the selection of accessories at your local Sainsbury's store. 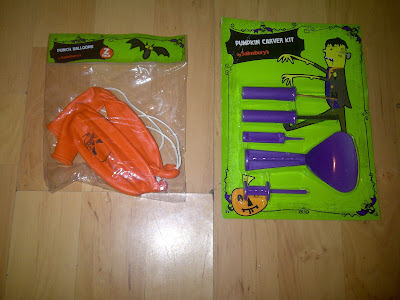 These punch balloons are a great treat for children this Halloween. I blew them up for Spud to play with whilst he patiently waited for Mummy to get everything ready for the big day! They are the perfect party bag balloon and can be used as decorations too! The pumpkin carving kit was a great help for me, I used the scoop to scoop out the pumpkin 'sick' (the insides) and used the carving tools to carve a spooky design into our pumpkins! Sainsbury's sent us three buckets this year, the Frankenstein light up fabric felt bucket, that unfortunately did not work for us, a piece had broken off in transit on our way to us and was unfixable and three plastic Trick or Treat buckets. 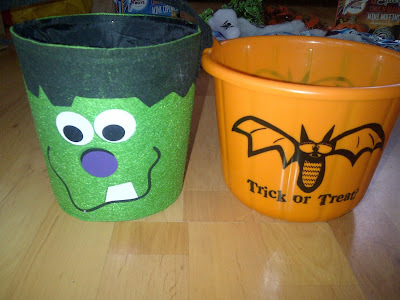 Both buckets can be used for your child to go Trick'or'Treating with, or they can be used for centre piece decorations (see further on in this post!). 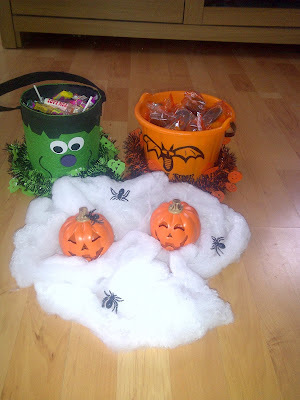 I used the two orange Trick or Treat buckets we was sent as part of the children's take home buckets. Because they always have so much to take home with them, party bags simply wont do! The look on their faces when they receive their buckets fill of treats and toys is priceless! Unfortunately, I did not get any more pics of these two sweet delights, Spud very kindly gave the milk chocolate skull lolly to my brother who wolfed it down in seconds and the brownies were so yummy they just couldn't be left sat in their packets! The brownies were sent via special request by myself after tasting them last year and falling in love with them! They are the yummiest brownies I have ever tasted! Halloween Mini Chocolate Balls - Pumpkins, Brains & Eyeballs. Every year Sainsbury's send us a much bigger selection than the previous year and its quite easy to see why they are all of our favourites! 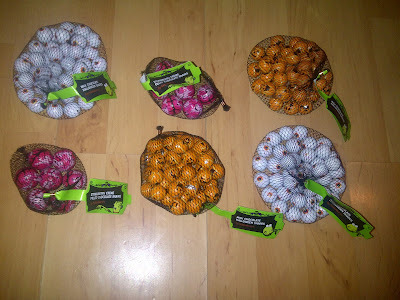 We was sent two bags of solid milk chocolate pumpkin balls, two bags of solid milk chocolate eye balls and two bags of strawberry crème filled chocolate brains. These are great to give away to Trick'or'Treaters or are perfect to divide between the children & in even adults who attend your Halloween party! 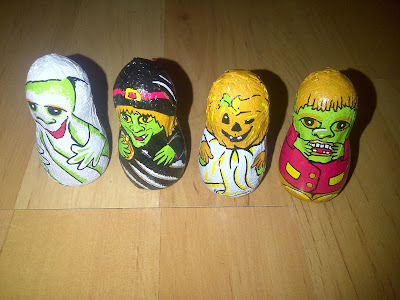 Jelly Pumpkin & Ghost Lollies & Hollow Milk Chocolate Halloween Figures! 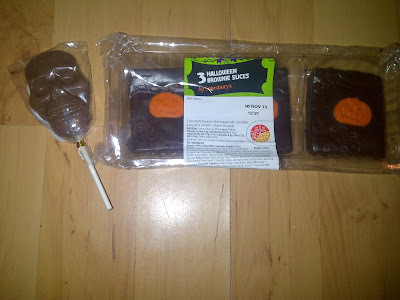 I popped into my local Sainsbury's and found a large range of their own Halloween treats on offer for 3 for 2. 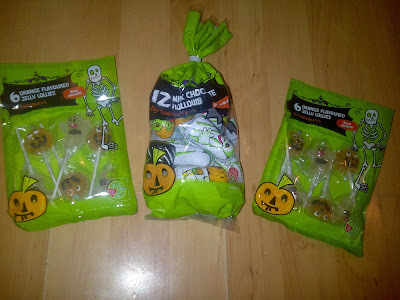 I picked up two packets of orange flavoured jelly lollies which contained three ghost shaped lollies and three pumpkin shaped lollies, one packet was used to fill the piñata (one for each child) and the other packet was used for their party buckets, again one for each child. I also picked up one packet of hollow milk chocolate Halloween figures which contained 12 different Halloween characters - a ghost, a witch, a pumpkin and Frankenstein. These were new to me as you usually only see these kind of hollow chocolates at Christmas time. I again gave one to each child for their piñata bag and one for each child in their take home buckets. 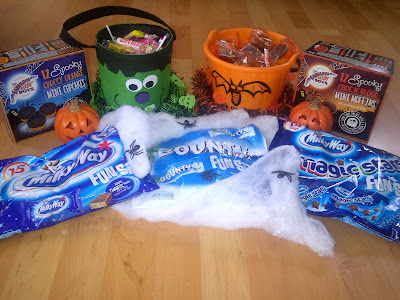 Not only do Sainsbury's sale a great range of their own sweets and treats this Halloween but you can also pick up the familiar favourites for the 31st of October. We made a little display with the two buckets Sainsbury's sent us, along with the cobweb and spiders and also the mini light up pumpkins (see above for info on all of those great products!) we filled one bucket with the Fabulous Bakin Boys muffins and cupcakes (read the review here) and the other bucket with some Swizzel Matlow favourites (read the review here). Set the perfect little scene by your front door this Halloween with some simple and basic decorations from Sainsbury's. 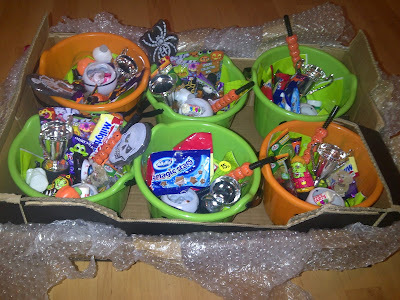 Wrap some tinsel garland around your treat buckets and surprise your visitors and guest on Halloween night! What ever your doing this Halloween, Sainsbury's can be sure to help you on your special night. Whether your staying in to trick your little door knocking guest, pop down to Sainsbury's for all your treats and decs or maybe your taking your children out this year? Why not check out Sainsbury's great range of costumes and lastly, if your having a Halloween party, you must check out their in store range! Be the talk of the graveyard with the whole heap of decorations and delights available from Sainsburys! To find your nearest store or for more information check out the official Sainsbury's website here.